Billie Holiday, Lady Day, ou plus simplement Billie, telle qu’avec tout l’amour et tout le respect du monde la nomme la cohorte de tous ceux et de toutes celles qui l’aiment et qui ne peuvent se passer d’elle, c’est la légende du jazz qui touche au plus profond le plus grand nombre. À la fois proche et inaccessible,, elle émeut celle qui trouvent dans son chant la sœur qui sait exprimer le mal de vivre et les blessures du passé. Elle trouble aussi bien ceux qui veulent entendre chez l’artiste la femme, la compagne de la vraie vie, par-delà les paillettes du spectacle. Sur des tempos lents ou moyens, sans jamais aucun effet de virtuosité vocale, mais avec une maîtrise absolue de la musique et des notes et de celle des mots, Billie Holiday chante des amours rarement heureuses, des hommes peu fidèles, les enfants qu’elle n’a pas eus, le temps qui passe et la solitude. Elle est ici au faîte de son grand art, entre une adolescence qu’elle n’a jamais connue et le déclin de ses douloureuses dernières années. 1.Without Your Love02:52 (Lange J. - Stryker F.) Billie Holiday and Her Orchestra : Buck Clayton (tp), Edmond Hall (cl), Lester Young (ts), James Sherman (p), Freddie Green (g), Walter Page (b), Jo Jones (d). 2.Lover Man03:17 (Ramirez Roger Davis James Sherman James - Ramirez Roger Davis James Sherman James) with Toots Camarata and His Orchestra. 3.As Time Goes By03:11 (Hupfeld Herman - Hupfeld Herman) with Eddie Heywood and His Orchestra : Doc Cheatham (tp), Vick Dickenson (tb), Lem Davis (as), Eddie Heywood (p), John Simmons (b), Sidney Catlett (d). 4.My Man (Mon Homme)02:58 (Pollock Charles - Yvain Maurice) with Bobby Tucker (p), Mundell Lowe (g), John Levy (b), Denzil Best (d). 5.More Than You Know03:08 (Eliscu Edward - Youmans Vincent Rose Billy) with Teddy Wilson and His Orchestra : Roy Eldridge (tp), Benny Carter (as), Ernie Powell (ts), Teddy Wilson (p), Danny Barker (g), Milt Hinton (b), Cozy Cole (d) . 6.Them There Eyes02:49 (Tauber Doris - Pinkard Mitchell Tracey William C.) with Sy Oliver and His Orchestra. 7.He's Funny That Way03:08 (Whiting R.A. - Moret N.) with Eddie Heywood and His Orchestra : Shad Collins (tp), Leslie Johnakins, Eddie Barefield (as), Lester Young (ts), Eddie Heywood (p), John Collins (g), Ted Sturgis (b), Kenny Clarke (d). 8.All Of Me03:19 (Simons Seymour - Marks Gerald) with Louis Armstrnog (voc) and Sy Oliver and His Orchestra. 9.You Can't Loose A Broken Heart02:56 (Miller F.E. - Johnson J.P.) with Eddie Heywood and His Orchestra featuring Roy Eldridge (tp), Eddie Heywood (p). 10.God Bless The Child02:57 (Herzog Arthur J.R. - Holiday Billie) with Bill Stegmeyer and His Orchestra. 11.Good Morning Heartache03:08 (Fisher D. - Higginbotam I. Drake E.) with The Jazz at the Philarmonic featuring Joe Guy (tp), Illinois Jacquet (ts), Kenny Kersey (p). 12.The Man I Love03:03 (Gershwin Ira - Gershwin George) same as 12. 13.Gee Baby, Ain't I Good To You02:19 (Razaf Andy - Redman Don) same as 8. 14.Let's Do It02:56 (Porter Cole - Porter Cole) same as 4. 15.I Love You Porgy02:58 (Gershwin Ira - Gershwin George) with Louis Armstrong (voc). Same as 9. 16.My Sweet Hunk O' Trash03:21 (Miller F.E. - Johnson J.P.) with Bob Hagaart and His Orchestra. 17.Don't Explain03:24 (Herzog Arthur J.R. - Holiday Billie) same as 7. 18.Gettin' Some Fun Out Of Life03:03 (Burke J. - Leslie E.) with Frankie Newton and His Orchestra. 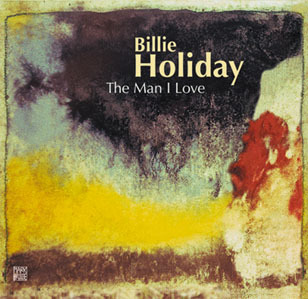 19.Fine And Mellow03:19 (Holiday Billie - Holiday Billie) same as 3. 20.Embraceable You03:17 (Gershwin Ira - Gershwin George) Billie Holiday and Her Orchestra : Buck Clayton (tp), Dicky Wells (tb), Lester Young (ts), Margaret Johnson (p), Freddie Green (g), Walter Page (b), Jo Jones (d). 21.I Can't Get Started02:49 (Gershwin Ira - Duke Vernon) with Bob Hagaart and His Orchestra. 22.Solitude03:10 (Delange E. - Ellington Duke) with Bob Hagaart and His Orchestra.